These numbers reflect estimated student expenses for the 2018-2019 school year. Amounts will change slightly from year to year, but as the cost of college increases, the scholarship packages will correspondingly increase. Your official financial aid award will be included in a letter directly from Princeton. Outside funding from private sources are used to reduce the campus job and summer savings portions of the aid package. Once the earnings amounts are fully replaced, additional outside funding can be used toward the purchase of a personal computer. Princeton grant funds are reduced only after these other options have been exhausted. Students who are not covered by a family health insurance policy must purchase Student Health Plan coverage for an estimate $1,800. Financial aid is available to cover the health plan cost. This estimate does not include the cost of travel, which may range between $100 and $2,500. Students must maintain satisfactory academic progress. Students are expected to contribute 5% of their personal savings toward college expenses. This contribution will decrease the amount of the Princeton grant. Princeton is firmly committed to meeting the full need of every qualified student with an aid package that does not require a loan. The average aid award at Princeton is made up of 96% scholarship and 4% campus job, with zero student loan. For families making up to $65,000 per year, the aid package covers full tuition, residential college fee, room and board. Even if your family does not fall into this category, keep in mind that Princeton provides generous no-loan packages to students from a broad range of financial circumstances. You can get an idea of the financial aid package you might receive by using the Princeton Financial Aid Estimator. 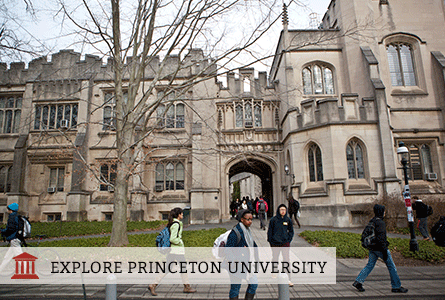 The Estimator is a convenient calculator based on Princeton's actual financial aid formula. If you provide accurate information about your family's finances, the estimated award figured for you will be very realistic. 60% of Princeton students receive need-based aid and the average grant for students admitted to the Class of 2021 was over $50,000. Learn more. Princeton's financial aid packages meet 100% of need and consist of only grants and work study, not loans. This allows students to graduate without debt. Use Princeton's Financial Aid Estimator to estimate the financial aid for which you are eligible.